Listening Library, 2007. 21 hours, 40 minutes. 12 cassettes. Review written February 22, 2008. I read Harry Potter and the Deathly Hallows last summer, and finally got to the top of the request list to listen to the cassettes. After finishing the book a second time, I’m again hit by sadness that the story is over, that there isn’t any more. I’m reviewing the audiobook separately because I simply have to gush about Jim Dale. He is incredible! His vocal range is amazing. He uses different voices for the enormous cast of characters and makes the books come alive. We’ve read all seven books aloud as a family, but I still get something new out of hearing Jim Dale read them. Of course, his British accent adds to the enjoyment! But more than that, his amazing expressiveness adds a whole new dimension to the books. If you love Harry Potter, here’s a way to enjoy the series afresh. If you haven’t read the books and have been meaning to, treat yourself to listening to them. 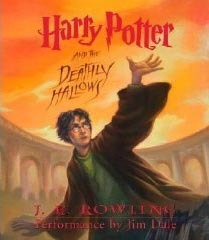 This entry was posted on Tuesday, January 13th, 2009 at 11:51 pm and is filed under Audiobooks, Fantasy, Stand-outs, Starred Review, Teen Fiction Review. You can follow any responses to this entry through the RSS 2.0 feed. You can leave a response, or trackback from your own site.